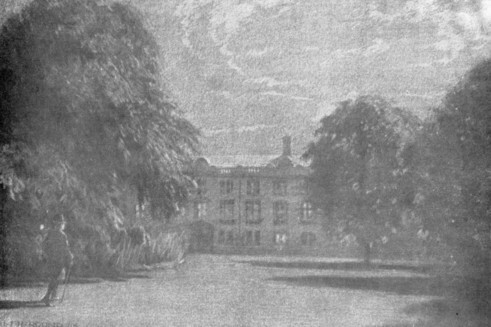 This month marks the centenary of an unusual but accomplished Jamesian ghost story, A P Baker’s A College Mystery: the story of the apparition in the Fellows' Garden at Christ's College, Cambridge . . . With five drawings of Christ's College, Cambridge, by F. H. Round (Cambridge : W. Heffer & Sons, 1918). Though the copyright page bears a 1918 date, the book was in fact published in January of the following year (according to The English Catalogue of Books for 1919). A College Mystery is presented as a “real” ghost story, complete with spoof press reports and documents, but is in fact a slim novel of 80 pages or so. This is a very modern approach, and because of this it has sometimes been taken as a true account: the British Library catalogue finds the need to add the explanatory note “[A Tale]” for its records. It is lucidly written, with an assurance about the structure, and a plausible deployment of the “documentary” sources: deft and highly readable. The bibliophile and book cataloguer Robert Eldridge notes: “The dry tone of this story (and similar ones) would have been soporific had not the ghost business been established at the outset. Thereafter, the dryness adds a pleasingly contrapuntal tone to the story.” There was a “second edition” in 1923 or, as Eldridge argues, in fact a remainder issue of the first edition with the new date added. There is a 2016 print-on-demand paperback reprint from Ostara Publishing. The book included atmospheric illustrations by F H Round. Frank Harold Round (1879-1958) was a botanical illustrator known for his sumptuous work for The Genus Iris by William Rickatson Dykes (Cambridge University Press, 1913), for which he provided forty-seven coloured drawings. He was described then as the drawing master at Charterhouse. He also did landscape pictures. The author of A College Mystery, whose full name was Arthur Ponsford Baker, was born in 1873 and died aged only 45 in 1919. He published one other book, University Olympians; or, Sketches of Academic Dignitaries (Cambridge: W. Heffer & Sons, 1914), light verses in rhyming couplets about Oxbridge ‘types’ of the time, such as The Master, The Tutor, The Bursar, The Steward. These were originally published in The Cambridge Review. There is an excellent discussion of the ghost story and its author by Rosemary Pardoe in The Ghosts & Scholars M R James Newsletter Issue 8 (September 2005), available online here. Picture: "The figure of a man crossed a patch of comparative light on the darkness of the lawn". The Fellows' Garden, Christ's College, Cambridge (South View) by F.H. Round, from A College Mystery, via the Ghosts & Scholars website. Just ordered an ex-library copy - thanks for the tip as I was unaware of this story.